تصدر مجلة تكريت للعلوم الهندسية مجلدا واحدا سنويا يضم أربعة أعداد وتغطي كل التخصصات الهندسية. تهدف المجلة إلى تنمية المعرفة في مجال الهندسة والعلوم المتعلقة بها وتطويرها ونشر البحوث المبتكرة وتحال البحوث التي ترد إلى المجلة لغرض تقويمها إلى خبراء ذوي سمعة علمية متميزة من اجل إثراء المكتبة الهندسية في حقل الاختصاص وقد يقبل البحث للنشر أو يعتذر عنه وستعاد البحوث غير المقبولة للنشر إلى مقدميها علما أن المجلة تنشر البحوث التي تحصل على تقييمين لكل بحث بدرجة قيم أو أصيل.1- أسلوب التقديم: يقدم البحث بأربع نسخ من ضمنها النسخة الأصلية مع تعهد خطي مؤرخ وموقع من الباحث يتعهد فيه بعدم نشر البحث أو تقديمه للنشر أو سبق وان نشر في مكان أخر. لن تنظر المجلة بالطلبات غير المصحوبة بهذا التعهد.2- لغة البحث: يكتب البحث باللغة الانكليزية مع خلاصة باللغة الأخرى ويفضل أن يكتب البحث بصيغة الشخص الثالث على أن تزود المجلة بقرص CD محمل عليه البحث بالصيغة النهائية بعد إكمال التصحيحات وفق تعليمات النشر مع نسخة نهائية أصلية.3- الطباعة وأبعاد الورق: تعتمد المجلة أسلوب التنضيد الجاهز مما يتطلب التقيد الدقيق بالضوابط الآتية: - تترك حاشية 3 سم من كافة جوانب الورقة وتكون كتابة البحث بنظام العمودين في الورقة الواحدة وتكون المسافة الفاصلة بين العمودين 1 سم اما الخلاصتين باللغتين فتطبع بنظام العمود الواحد في الورقة الواحدة و الجداول والأشكال الكبيرة توضع في نهاية البحث وبالطباعة العادية. - تطبع البحوث بمسافة واحدة بين الأسطر على ورق A4 باستخدام نظام Word نوع الخط Arial حجم 10 للغة العربية والخط Arial للبحوث باللغة الانكليزية. - لا تزيد عدد صفحات البحث الكلية عن 10 صفحات بغض النظر عن لغة البحث. This paper presents the results of laboratory model tests of bearing pressure of circular and ring footing on sand. The effects of the embedment depth, internal friction of sand and the ratio of the inner to the outer diameter of the ring footing have been studied, in order to understand the behavior of the sand under the ring footing comparing with the circular one. An optimum ratio of the inner to outer diameter of the ring footing have been indicated which was (0.4), at which the bearing capacity will be greater than the circular footing. Also, the results indicated that there was no interested effect of the embedment depth on that optimum ratio. في هذا البحث تم دراسة قابلية تحمل الأساس الحلقي بالمقارنة مع الأساس الدائري على تربة رملية باستخدام نموذج مختبري لهذا الغرض. تم دراسة تأثير عمق دفن الأساس، زاوية الاحتكاك الداخلي للتربة الرملية ونسبة القطر الداخلي إلى القطر الخارجي للأساس الحلقي على قابلية التحمل، في محاولة لفهم سلوك التربة الرملية تحت الأساس الحلقي مقارنة مع الأساس الدائري. تم تحديد قيمة مثلى لنسبة القطر الداخلي الى القطر الخارجي للأساس الحلقي وقد وجد انها تساوي (0.4)، والذي تزداد عنده قابلية التحمل عن الأساس الدائري، كذلك تبين عدم وجود تأثير واضح لعمق دفن الأساس على تلك النسبة. Bearing capacity --- Circular footing --- Ring footing --- قابلية التحمل، الأساس الدائري، الأساس الحلقي، تربة رملية.. In this tribological study, we highlight the effect of lubricating oil viscosity in the Multi-pads hydrodynamic journal bearings generate important improvement in characteristics of stiffness and stability in the high speed turbomachines. Depending on viscosity of oil film (three values) variation for five tilted pads bearing, each pad is pivoted and is facilitated to be tilted with small angles, by using Matlab program, we calculate the oil film thickness for convergence layer. We applied Reynold's equation and solved it's numerically by using finite difference method with 5 nodes technique to find the pressure distributed on each node in the mesh of tilted pad, then calculate stiffness coefficients. Results show that there is clear effect on stiffens with viscosity change. The increase in value of Krr (for n = 0.3) between viscosity (0.04 Pas. s) and viscosity (0.058 Pas. s) is14.33 MN/m, while the increase in Krr value between viscosity (0.058 Pas. s) and viscosity (0.087 Pas. s) is 11.37 MN/m. the increase in value the of Kss (for n = 0.3) between viscosity (0.04 Pas. s) and viscosity (0.058 Pas. s) is5.921 MN/m, while increase in Kss value between viscosity (0.058 Pas. s) and viscosity (0.087 Pas. s) is9.55 MN/m respectively. the increase in value of Ksr (for n = 0.3) between viscosity (0.04 Pas. s) and viscosity (0.058 Pas. s) is 8.95 MN/m, while the increase in Ksr value between viscosity (0.058 Pas. s) and viscosity (0.087 Pas. s) is 14.41 MN/m respectively. the increase in value of Krs (for n = 0.3) between viscosity (0.04 Pas. s) and viscosity (0.058 Pas. s) are 5.08 MN/m, while the increase in Krs value between viscosity (0.058 Pas. s) and viscosity (0.087 Pas. s) is8.19 MN/m respectively. The values of the dominate principal coefficients Krr is greater than that of Ksr, also The values of the principal coefficients Kss is greater than that of cross coupling Krs for all values of viscosity that studied. From this result, we can conclude the side effect of cross coupling coefficients (Ksr ,Krs) can be overcome by great values for principal coefficient (Krr, Kss) respectively, so we can get good improvement instability for this bearing by variation the viscosity. After that, we regarded to use high viscosity lubricant in multi-pad journal bearing to improve the performance and stability by controlling the stiffness coefficients. This work presents the analysis and modeling of communication network used for data transmission with multi-protocols in campus network. The designed network is based on the geographical location of communication nodes. (Colleges and centers). Network optimal backbone is first designed by Kruskal algorithm. It will be subject to reliability improvement by links addition. Tie-sets method is used to evaluate the network reliability. Communication nodes are modeled using local area network (LAN), server, links, router, switch, and Firewall. Intranet will be used as communication backbone mainly to connect different communication nodes with the Principal Communication Center (PCC) where the System Server (SS) is located. The connection of Intranet to the Internet is mad via the front-end system server (SS). 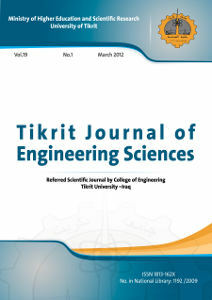 Tikrit University Intranet (TUI) is taking as case study in the present research. Tikrit University sites are grouped into master communication nodes. Each node is composed from several colleges, centers, and administrative sections. نموذج رياضي تصحيحي لمعطيات الظروف الميترولوجيا لمناطق تكريت,طوز خورماتو وكركوك العراق. تم في هذا البحث جمع وتحليل (2800) عينة من أربعة أحياء سكنية مختلفة في تكريت على مدار فصول السنة لتغطية التغيرات الفصلية في معدل إنتاج النفايات الصلبة المنزلية. وقد بلغ معدل إنتاج النفايات الصلبة المنزلية (0.460) كغم/شخص/يوم. كما بينت النتائج أن أكثر فصول السنة إنتاجا للنفايات الصلبة المنزلية هو فصل الصيف إذ بلغ معدل الإنتاج فيه (0.487) كغم/شخص/يوم، في حين أن أدنى معدل إنتاج كان (0.422) كغم/شخص/يوم شتاءً. في حين بينت النتائج أن أعلى معدل إنتاج للنفايات الصلبة المنزلية سجل خلال يومي الجمعة والسبت وبمعدل (0.629) و (0.557) كغم/شخص/يوم على التوالي. كما أظهرت النتائج تأثير الطابع الريفي لمنطقة العلم في خفض معدل إنتاج النفايات الصلبة المنزلية إذ بلغ معدل الإنتاج للأحياء الأربعة المدروسة (0.460) كغم/شخص/يوم، أما للأحياء المدروسة ماعدا منطقة العلم فقد بلغ معدل الإنتاج (0.478) كغم/شخص/يوم.وقد تم اعتماد طريقة التحليل الإحصائي باستخدام برنامج SPSS لدراسة تأثير كل من حجم الأسرة ومستوى الدخل لها على معدل الإنتاج في المدينة. حيث أظهرت النتائج أن لحجم الأسرة تأثيراً عكسياً على معدل إنتاج الفرد الواحد من النفايات الصلبة المنزلية، كما أن أدنى معدل أنتاج كان للأسر ذات الدخل الجيد. This research included collection and analysis of (2800) samples from four different neighborhoods in Tikrit over the seasons of the year to cover seasonal changes in the generation rate of domestic solid waste. The generation rate of domestic solid waste is (0.460 kg / person / day). The results also showed that summer season is the most season that produced solid waste (0.487 kg / person / day). While winter is the lowest season (0.422 kg / person / day). The results indicated that Friday and Saturday are the most producing days (0.629 , 0.557 kg / person / days), respectively. The results showed the impact of rural character of Aalam region in reducing the rate of generation of domestic solid waste as the rate of generation of the neighborhoods of the four studied areas was (0.460) kg / person / day. SPSS program using has been adopted as a method of statistical analysis to study the effect of family size and income level have on the generation rate in the city, where the results showed that family size adversely affects the generation rate of solid waste, also the lowest generation rate was recorded for families with high income level. معدل الإنتاج ، النفايات الصلبة المنزلية. تم خلال البحث دراسة درجة الحامضية للسقيط المطري لمدينة تكريت عن طريق اختيار أربع مناطق متفرقة فيها,للفترة من1 – شباط ولغاية 1- نيسان 2007/ وهي الفترة التي سقطت فيها الأمطار خلال هذه السنة. تم إجراء الفحوصات الكيمياوية للعينات لمعرفة درجة الحامضية للسقيط المطري من خلال قياس الرقم الهيدروجيني (pH) كمؤشر مباشر للحامضية , وقياس تراكيز أيونات الكبريتات (SO4-2) وأيونات النترات (NO3-) كمؤشرات غير مباشرة. وجد أن قيم الرقم الهيدروجيني (pH) تتراوح بالمدى (6.4-5.56 ) ومن خلا ل التحليل الإحصائي تبين أن قيم الرقم الهيدروجيني المسجلة كانت طبيعية والقيمة الوحيدة التي تقل عن الحد الطبيعي يمكن اهمالها .تراوحت تراكيز الكبريتات (SO4-2) بالمدى (223-88) ملغمِِِِِ لتر فيما تراوحت تراكيز النترات بالمدى (170-80) ملغمِِِِِ لتر . تراوحت سرعة الرياح ,ودرجات الحرارة , والرطوبة النسبية خلال أيام جمع العينات بالمديات 4-2.25 م/ثا , 26-1 م0 و%90-%22 على التوالي . In this work a plain (conventional) and a tilted bad bearings are analyzed and studied (both have the same dimensions and work conditions). Three, four and five pads models are studied. The pads are fixed circumferentially in a manner each two close pads are separated with an angle that is the same for all the close pads.Each pad is pivoted in its trailing edge and is facilitated to be tilted around this pivot with small angles. This study was achieved for three values of tilting angles. These angles are, 0.01o, 0.011o and 0.012o. Two dimensions' form of Reynolds equation is used and solved numerically then the stiffness coefficients had been calculated. A comparison had been done between the stiffness coefficients values for the two models (tilted pads and conventional bearings). The results of this comparison was found that (for n = 0.4), are, +28%, +275%, +270 % and -100% for Ksr, Krr, Kss and Krs respectively. It was noticed that the values of the principal coefficients Krr and Kss are increased significantly while the cross coupling coefficient, (Krs) is decreased significantly and (Ksr) is increased slightly. And this is a positive sign for stability improvement. Also it was found that increasing the tilt angle (delta) cause an increase of the stiffness coefficients values. These increases (for n = 0.4 and changing the tilt angle from 0.010 to 0.011 then to 0.012 respectively) are, Krr=+50%, +47%, Kss = +40%, +32%, Ksr = +33%, +42%, and Krs = +15%, +20%. And since increasing the values of the cross coupling coefficients make the bearing stability worse, so increasing the tilt angle is not apreferable method for improving stability. Changing the number of pads is a better solution and it was found that three pads bearing is the best among them. في هذا البحث تمت دراسة مسند تقليدي وآخر ذو وسادات قابلة لألمالة والضبط حول حافاتها األمامية. حيث ان كال المسندين لهما نفس األبعاد وظروف العمل. تمت دراسة مسند ذو ثالثة وأربعة وخمسة وسادات. في كل منها تكون الوسادات مثبته محيطياً على جسم المسند وتنحصر بينها فضاءات محيطية متساوية وفي نفس الوقت الزاوية o المركزية ألي وسادة تكون مساوية للزاوية المركزية ألي فضاء. أنجزت هذه الدراسة لثالث قيم لزاوية إمالة الوسادات. هذه القيم هي , 0.01 o و 0.011 o 012.0 . حيث تم معادلة رينولدز والتي حلت عدديا باستخدام تقنية الفروقات المحددة ومن ثم تم إيجاد معامالت النابضية لكلي المسندين (التقليدي وذو الوسادات) وكانت النتيجة كما ً استخدام يلي: لنسبة المركزية مقدارها )4.0 = n )فأن قيم معامالت النابضية األربعة Ksr ,Krr, Kss وKrs على التوالي للمسند ذو الوسادات تزيد بمقدار %28%,+275%,+270 + و%100 -على التوالي مقارنة بقيمها للمسند التقليدي . من النتائج أعاله يمكن مالحظة زيادة قيم معامالت النابضية األساسية ) Kss, Krr )ونقصان ملحوظ لمعامل النابضيةالمستعرض Krs وهذا مؤشر على تحسن أستقرارية المسند ذو الوسادات على الرغم من الزيادة القليلة للمعامل Ksr .كذلك وجد أن قيم هذه المعامالت للمسند ذو الوسادات قد o زادت بزيادة زاوية أمالة الوسادات وكما يلي: بتغيير زاوية أمالة كل وسادة من الى 0.010 o الى 0.011 o ثم 012.0 ولقيمة نسبة المركزية مقدارها )4.0 = n )فأن كل معامالت النابضية األربعة قد زادت وكما يلي: Krr قد زاد بمقدار %50% ,+47 +على التوالي، Kss قد زاد بمقدار ,%32% +40 ، +Ksr قد زاد بمقدار % 33 ,%42 .Krs قد زاد بمقدار %15%, +20 . +مادامت زيادة زاوية إمالة الوسادات يؤدي الى زيادة كل معامالت النابضية بنوعيها، األساسية ) Kss, Krr )والمستعرضــة )Ksr، Krs )لذا فأن زيادة زاوية أمالة الوسادات التعد الطريقة المفضلة لتحسين استقراريه المسند ويبقى أسلوب زيادة عدد الوسادات هو الحل األمثل لتحسين األستقرارية وبالتحديد استخدام المسند ثالثي الوسادات. The experiment was conducted at Heat Laboratory - College of Engineering - University of Baghdad during 2013. Three local diesel fuel included Baiji, Daura, Basrah. Five levels of engine speeds included 2000, 2250, 2500, 2750, 3000 RPM and five levels of loads included 2, 4, 6, 8, 10 Nm were used in this study. This study repeated in winter season in January under 13°C and in summer season in July under 39°C. The tests of this research were carried out on four stroke diesel engines to evaluate the effect of winter and summer season on diesel engine performance parameters by using different types of local fuel under different speed and loads. The experiment was executed according to a split split plots design under Randomized Complete Design (RCD) with three replications. Least significant differences (L.S.D) were used to compare means of treatments at 0.05 level. Performance parameters of engine were studied in this experiment are specific fuel consumption, indicated power, exhaust temperature, volumetric efficiency.The results obtained reveals lowest specific fuel consumption was in Daura fuel in summer. Better indicated power was in Daura fuel in summer. Lowest temperature was in Daura fuel in summer. Best volumetric efficiency was in Daura fuel in winter. Lowest specific fuel consumption was in Daura fuel at 2750 RPM in summer. Better indicated power was in Daura fuel at 3000 RPM in summer. Lowest temperature was in Daura fuel at 2000 RPM in summer. Best volumetric efficiency was in Daura fuel at 2000 RPM in winter. Lowest specific fuel consumption was in Daura fuel at 10 Nm in summer. Better indicated power was in Daura fuel at 10 Nm in summer. Lowest temperature was in Daura fuel at 2 Nm in summer. Best volumetric efficiency was in Daura fuel at 2 Nm in winter. Lowest rate of specific fuel consumption was in Daura fuels at 2750 RPM, at 10 Nm in summer. Highest rate of indicated power was in Daura fuel at 3000 RPM at 10 Nm in summer. Lowest ratio of temperature was in Daura fuels at 2000 RPM at 2 Nm in summer. Highest rate of volumetric efficiency was in Daura fuel at 2000 RPM at 2 Nm in winter. أجريت التجربة في المختبر الحراري- قسم الهندسة الميكانيكية - كلية الهندسة - جامعة بغداد في العام 2013. استعملت في هذه الدراسة ثلاثة مصادر لوقود الديزل بيجي , دورة , بصرة, وخمسة مستويات لسرعة المحرك 2000 , 2250 , 2500 , 2750 , 3000 RPM وخمسة مستويات من الأحمال 2 , 4 , 6 , 8 , 10 Nm. وأعيدت التجربة في شهر كانون الثاني في درجة حرارة 13°م وشهر تموز في درجة حرارة 39°م. نفذت التجربة على محرك ديزل رباعي الاشواط لدراسة تأثير موسم الشتاء والصيف على كفاءة اداء محرك الديزل باستعمال ثلاثة انواع من الوقود المحلي تحت تأثير خمسة سرع وخمسة احمال مختلفة. نفذت التجربة وفق تصميم التجربة المنشقة المنشقة تحت التصميم الكامل العشوائي (RCD) وبثلاثة مكررات واختبرت الفروق المعنوية بطريقة اقل فرق معنوي على مستوى احتمالية 0.05. وكانت الصفات المدروسة استهلاك الوقود النوعي والقدرة البيانية ودرجة حرارة العادم والكفاءة الحجمية.أظهرت النتائج ان اقل استهلاك نوعي للوقود كان عند استخدام وقود الدورة في الصيف. أفضل قدرة بيانية كانت عند استخدام وقود الدورة في الصيف, اقل درجة حرارة للعادم كانت عند استخدام وقود الدورة في الصيف. أفضل كفاءة حجمية كانت عند استخدام وقود الدورة في الشتاء. اقل استهلاك نوعي للوقود كان باستخدام وقود الدورة عند السرعة 2750 RPM في الصيف. أفضل قدرة بيانية كانت باستخدام وقود الدورة عند السرعة 3000 RPM في الصيف. اقل درجة حرارة للعادم كانت باستخدام وقود الدورة عند السرعة 2000 RPM في الصيف. أفضل كفاءة حجمية كانت باستخدام وقود الدورة عند السرعة 2000 RPM في الشتاء. اقل استهلاك نوعي للوقود كان باستخدام وقود الدورة عند العزم 10 Nm في الصيف. أفضل قدرة بيانية كانت باستخدام وقود الدورة عند العزم 10 Nm في الصيف. اقل درجة حرارة للعادم كانت باستخدام وقود الدورة عند العزم 2 Nm في الصيف. أفضل كفاءة حجمية كانت باستخدام وقود الدورة عند العزم 2 Nm في الشتاء. اقل استهلاك نوعي للوقود كان باستخدام وقود الدورة عند السرعة 2750 RPM عند العزم 10 Nm في الصيف. أعلى قدرة بيانية كانت باستخدام وقود الدورة عند السرعة 3000 RPM والعزم 10 Nm في الصيف. اقل درجة حرارة عادم كانت باستخدام وقود الدورة عند السرعة 2000 RPM والعزم 2 Nm في الصيف. أفضل كفاءة حجمية كانت باستخدام وقود الدورة عند السرعة 2000 RPM والعزم 2 Nm في الشتاء. Engine parameters in winter and summer season --- analysis of local fuel --- Baiji --- Daura --- Basrah fuel. --- اداء المحرك في موسم الصيف والشتاء، تحليل الوقود المحلي، وقود الدورة وبيجي والبصرة. The hydro engineering characteristics of Al-Ajeej basin which was located within south Sinjar plain north west Iraq was analyzed to predict the possibility of surface runoff harvesting during rainfall season in the upstream sites in this basin using watershed modeling system (WMS). The hydrological feasibility of constructing small dam on Al-Ajeej valley with some preliminary design calculations were presented. The best optimum dam site was selected to be located (3.95) km downstream the confluence of Al-Badee branch with Al-Ajeej valley (35 46 6 Latitude and Longitude 41 36 11) having a catchment's area of (3043)km2. The proposed dam height was (12.5) meter with a dam length of (1277)m, while the normal storage volume of the reservoir is (38.8) million m3. Construction a dams in such sites characterized by water shortage during all around the year will give an aid in the sustainable development of such area by increasing the cultivation lands, the agricultural products and also modify the income of the villagers living in this area leading to prevent them leaving their lands to other places. تم دراسة وتحليل الخواص الهيدروهندسية لحوض وادي العجيج الذي يقع ضمن سهل سنجار الجنوبي شمال غرب العراق لتحديد أمكانية حصاد مياه السيح الناتجة عن الأمطار الساقطة في المواقع المتقدمة للحوض باستخدام نظام WMS، حيث اعتمدت بيانات الأمطار اليومية المسجلة في محطتي سنجار والبعاج للسنوات (1994-2006) في حساب معدل كميات السيح السطحي السنوية للحوض والتي بلغت حوالي 53144784 متر مكعب. كما تم دراسة الجدوى الهيدرولوجية لإنشاء سد إملائي صغير على وادي العجيج وعرض تصميم أولي لهذا السد واختير الموقع الأمثل له الذي يقع على بعد 3.95 كم من موقع التقاء فرع وادي البديع مع وادي العجيج ويفع على خط طول 11 36 41 وخط عرض 6 46 35 حيث بلغت المساحة المغذية له 3043 كم2. بلغ ارتفاع السد الإملائي المقترح12.5 متر وطول 1277 متر وخزين حوالي 38.8 مليون متر مكعب عند المنسوب الاعتيادي للخزان. أن أنشاء سدود صغيرة في مثل هذه المواقع والتي تتصف بشحة في المياه خلال معظم أيام السنة سوف يؤدي إلى دعم التنمية المستدامة لهذه المنطقة وذلك بزيادة مساحات الأراضي الزراعية والإنتاج الزراعي وتحسين دخل الفلاحين الساكنين فيها مؤديا إلى منع هجرتهم إلى مواقع أخرى تتوفر فيها المياه.